There are many communities in Nepal that are not developing and in which there are inadequate facilities and incentives to grow. Nawal Parasi was developed to provide opportunities for agriculture and medical growth by the Ray of Hope Society. Bright Hope World first met Niranjan in 2003 while he was a student at the South Asia Institute of Advanced Christian Studies (SAIACS) in Bangalore. Since his return to Nepal we have supported one project in Saptari. Bright Hope World staff visited Nepal on a number of occasions and in 2008 returned again to discuss future plans. A new community development partnership was developed that was very exciting. It has components of medical intervention, agriculture development, job creation and micro-enterprise loan support. The immediate beneficiaries are the people of Nawal Parasi who have access to the clinic. The clinic consists of treatment, access to specialists, affordable medicines and training in basic nutrition and health. Other beneficiaries include people who become members of the Society who have access to loans and other income generation and job creation projects. There are 580,000 people in the Nawal Parasi District. This clinic serves more than 8,000 people in the seven villages and the workers housing compound. The key people are Niranjan and Sonu Adhikary. 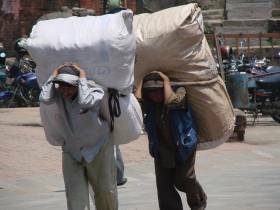 They live in Kathmandu. After training at University Niranjan was employed by Campus Crusade for Christ. He developed into a leadership role there, especially in training people. 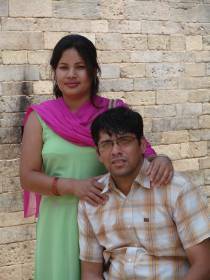 After marrying, they decided to go to SAIACS for further training and while there decided that, on returning to Nepal, he would look for a totally different model of doing ministry. He was and is very concerned about the dependence that much Christian ministry in Nepal has on outside funding and resources. He has subsequently developed a Nepali way of doing and funding ministry and training people in a different way. Many of these people have gone out into difficult areas to plant churches. There are now 17 of these churches in various parts of the country, often in small towns. Another person is now in charge of training, but many issues come back to Niranjan, especially leadership issues. Niranjan and Sonu are also involved in leading a small church near their house. They have two small children and live in their own house. 1) Establishment of a medical clinic in the community to treat at least 200 patients per day. This has created a profit that goes into the Resource Centre Fund. 2) Establishment of a model farm to show new farming methods and generate a profit. $US18,450 was then required over two years to establish the farming operation. There was also a need for around $US18,700 to boost the Resource Fund over three years to provide a strong capital base at the start. This project has now been completed and is self-sustaining and no further funds are required. NN (name withheld) is a mother of two children. Below her house there is a small room on the street from which she runs a sewing business. She is an expert tailor and makes a good living from her work. She has two people come in part time to help her. 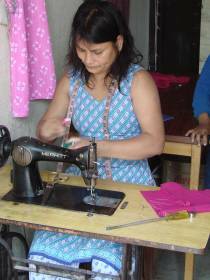 She sews for other people makes clothes and, from time to time, makes garments to sell. She has a plan to expand her business so she can train other people, employ six more and open a shop for the sale of material and clothing. This would involve renting a larger building with a shop, stocking the shop and decorating it, and buying some more machines. Her desire is to help more people become self sufficient as she is and to be able to give more so that Christian missionaries can be supported. To achieve this she wants a loan of around $US4,000. There is nowhere she can find that sort of money. It's exactly the sort of person who would benefit from the Resource Fund.